Clay Jenkins returns home from school to find a mysterious box with his name on it lying on his porch. Inside he discovers 13 cassette tapes recorded by Hannah Baker--his classmate and crush--who committed suicide two weeks earlier. I can't say enough about this book. It's the first book I've picked up in a long while that blew my mind. That's because Asher's debut exceeded my expectations on every level. It's beyond a quick read. Asher's writing is crisp and clean, and it wasn't frilly in the least. The deliberate brevity suits the story well and made some moments of Clay and Hannah's story unbelievably real. (I mention both of them because even though Hannah's voice only appears on audio tapes, it is truly their story.) All of the characters are unique and well-developed. I loved them, hated them, felt sorry for them and sometimes found myself wanting comfort or scream at them. The bottom line is that this novel moved me in a way that I don't think I've ever experienced. I know people are divided on this book, and that's fine because sometimes that's all an issues book like Thirteen Reasons Why needs to do. The point is that it makes you think about the issue at hand, in this case, suicide. (There are many more, but that's the main focus.) It forces you to step out of your own life and think about the "what ifs" and the things you're never considered in your own life. It forces you to consider that the decisions one person makes can affect other lives. 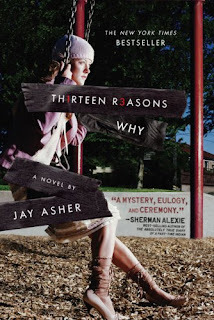 Thirteen Reasons Why does all of these things. Whether you like Hannah and Clay or hate them, you'll get an intimate picture of how the actions of many lead one girl to end her life and how her decision and the electronic ghost she leaves behind affects those she holds responsible. I read this book for the first time over the summer and was very moved by it. One of the recurring things I'd read on blogs was that they felt that Hannah killed herself over trivial things. My problem with that statement was that to Hannah they were NOT trivial in the least and when someone is suffering from depression like she was the littlest things can trigger the biggest reactions. I thought this book was a beautiful example of that. Haunting and realistic and simple, yet complex. Cat - I do feel very similarly. Depression affects everyone differently and it can cause people to do irrational things that in the moment seemed very rational to that person. I've witnessed this friends and family, and it's a scary thing. Sometimes people feel like the extremes are the ony way out of a bad situation. I absolutely LOVED this book! I read it a few years ago and I felt the exact same way you did. It definitely blew me away. I have passed this book around so much! I just want everyone I know to read this book just because it really makes you think. A friend of mine even said that it should be required reading in schools. I 100% agree. My best friend's brother committed suicide his freshman year, he was 14! I just can't imagine what was going through his mind. Reading this really makes you want to be a better person as well. So glad you did a review on this book!!! I adored this book as well and raved about it after I read it. I have recommended it to many! I just picked up this book at the library - I'm very excited to read it, especially after reading your review.